mcbrooklyn: Anchors Away: Anyone in Brooklyn Heights Know Where to Put a Monumental 19th Century Anchor? 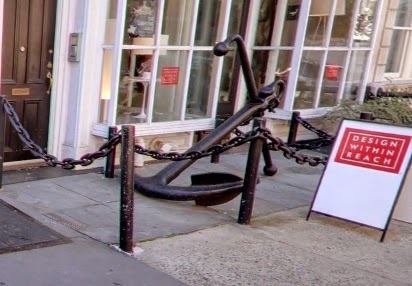 Anchors Away: Anyone in Brooklyn Heights Know Where to Put a Monumental 19th Century Anchor? The familiar anchor that's been resting outside 76 Montague Street in Brooklyn Heights for decades needs to find a new home. For many years the building was known as Sirius House; then it was the home of Design Within Reach. Soon, the venue will become the Friend of a Farmer restaurant, and the new owners say they would like to donate the anchor to the Brooklyn Heights community. Problem: Where to put it? We like where they put the Christmas tree on the Promenade.